I’m behind the wheel of Mini’s new Countryman soft-roader and all I can see is blue sky. The rutted stretch of bare earth I’m doggedly clambering up must be at least forty degrees from the flat. The diesel engine purrs quietly at 1,800rpm as I crest the rise, bounce for a few metres along the ridge and then turn sharply right to plunge back down the slope. There’s no hill descent mode so it’s a case of first gear plus cadence braking plus crossed fingers to maintain control. Back on the flat there’s a snaking course of sodden mud to negotiate. My left index finger accidentally strays to the stability control button for the five seconds it takes to switch the system off completely. Second gear, steady throttle, turn in, and the car surfs straight on like a thrown hammer. I instinctively add lock, the road tyres find a little grip from somewhere and the nose snatches suddenly in towards the apex, understeer trading places with oversteer. A frantic twirl of wheel and a dab more throttle and I’m four-wheel-drifting, gliding sideways through arcs of glutinous muck thrown up by the scrabbling tyres. In the middle of it all I find I’m laughing like a hyena. 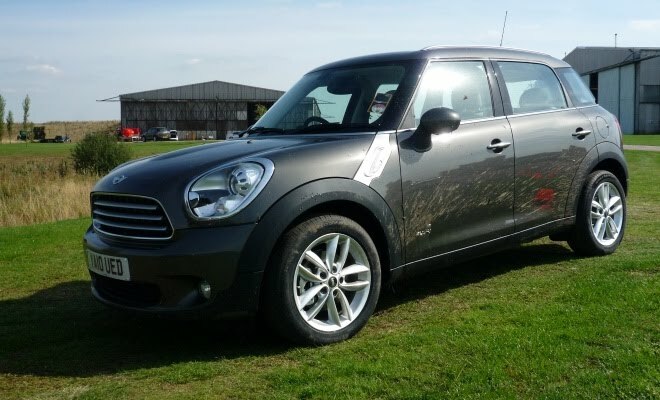 So is the Mini Countryman fun to drive? That would be a yes. The off-road capability of this four-wheel-drive Countryman Cooper D comes as quite a surprise. There’s not much axle articulation, the 17-inch run-on-flat tyres are distinctly road biased, and while the magnetic coupling on the rear differential can split torque front to back, it doesn’t do side to side. I’d have guessed this overgrown Mini might strand itself on a grass verge but I’m having to readjust my preconceptions. 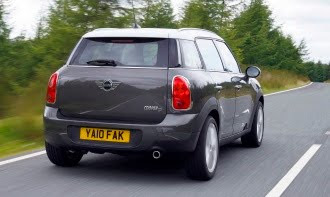 Before climbing aboard, my thoughts about the Countryman had been pretty unkind. Its looks don’t help – it resembles a crossbreed between an ordinary Mini hatch and a giant space hopper, leading me to expect a bit of wallowing around corners. 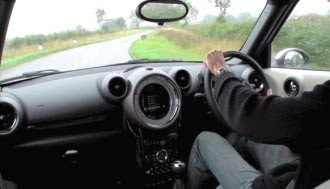 Far from it, the Countryman offers an extremely firm ride with strong anti-roll tendencies. You may sit a foot higher, but as you thump and skip along a British B-road you’ll be strongly reminded of the standard Mini’s go-kart ride. It’s fun and involving from the driving seat, not so amusing from the passenger pews, but is undeniably an authentic piece of Mini DNA. The old Austin models rode just as badly. The chassis is at least safe. After hosing off the mud, I put on a crash helmet and try an elk test, a high-speed double lane change under heavy braking, on a section of closed race track. There’s no drama, aside from thwacking my helmeted bonce against the door frame. Enthusiastic cornering proves neutral, with the stability control back on at least, and with the All4 system bringing the rear wheels into play as required. No doubt the two-wheel-drive version would be more inclined to understeer. So why am I writing about this car, on this blog about green cars? I did wonder why Mini invited me to play with its new toy, until Lee Connolly, Mini’s product planning manager, started arguing that the diesel Mini Countryman is the greenest 4x4 on the market. In either Cooper D or One D guise, the All4 version emits 129g/km on the official scoreboard, aided by stop-start, low-resistance tyres and other Minimalism tricks. By way of comparison, the similarly sized and equally new Nissan Juke diesel emits 134g/km – but in two-wheel drive form. Choose a single driven axle for your Countryman diesel and emissions are just 115g/km. So it may be green – ish. It’s also very nice on the inside, providing you turn a blind eye to the giant, cyclops speedometer staring out of the centre of the dash. Materials are good, seats are excellent, and all-round vision is exceptional for a modern car, thanks to the unusually upright windscreen and slender pillars. Rear legroom is good and the boot is not bad at all for a 4.1m car. There’s no spare wheel though, just those run-flat tyres that no doubt exacerbate the knobbly ride. It’s even vaguely affordable, with the two-wheel-drive One D starting at £17,000 on the road, before the inevitable extras. In the end I couldn’t help feeling a warm fondness for the Countryman. Which was an even bigger surprise than getting to the finish of that off-road track.